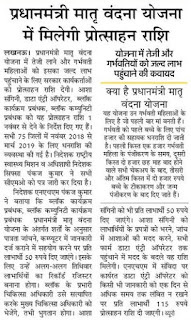 PM Matritva Vandana Yojana In UP Launched by CM Adityanath Yogi to give Rs.5000 For First Baby For Pregnant women to involve in financial assistance. 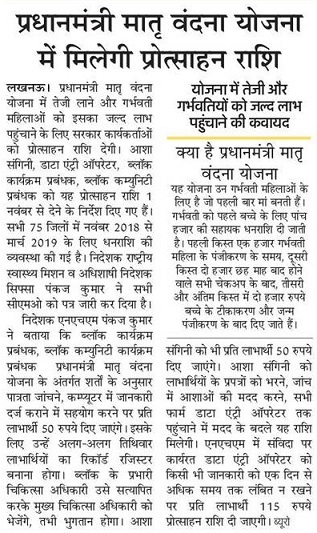 PM Matritva Vandana Yojana Application Form in UP are invited from Women to fill Pradhan Mantri Matritva Vandana Yojana (PMMVY) in Uttar Pradesh State Government. This is another Social welfare scheme of Women in India to give Security, Health related Problem and delivery of Child. Under this UP PMMVY Scheme you will be given amount Rs 5,000 into bank account named beneficiary women. Only those women will be eligible who were pregnant after 1 January 2017. Below is some latest knowledge, eligibility criteria which can help you to fill form of Pradhan Mantri surakshit Matritva Abhiyan guidelines. Asha Salary, Data Entry Operator, Block Karyakram Prabandhak, Block Community Prabandhak. PM Matritva Vandana Yojana Salary made from 1 November 2018 to March 2019. Name List of Pradhan Mantri Matritva Vandana Yojana: Rs.5000 support to pregnant women with its Matritva Vandana Yojana scheme. How to Apply: Interested beneficiary women need to link their Aadhar card with the bank account. 1. You will get 100% Benefit from (Government Hospital). 2. In Hospital of Government when you have make first entry in room, than new card given by Single Window Clerk, Nurse which have already mention Mantri Matritva Vandana Yojana. 3.Asha is the main source to get UP Matritva Vandana Yojana if you Living in village. Government has given responsibility to these ASHA for supporting women in stages of Ultra Sound, Taking Medicine and Injection time to time. Beneficiary: First time pregnant Women will get pm Matritva sahyog Yojana. Amount: The women will get Rs.5000 amount in three installments. At the time of first registration Rs 1,000 transferred in week period to beneficiary bank account. After 6 Month pregnancy, check up Rs 2,000 will be received. Rs 2,000 will be given after vaccination when newborn baby.